IN APRIL 1975, Chelsea were relegated from the first division. It had been a long-time coming, given two lack-lustre campaigns that saw the break-up of a richly-talented team that had reached three cup finals in as many years and had scarcely been out of the top six since the club returned to the top flight in 1963. The 1973-74 season had ended in complete disarray as two of the club’s prized players, Peter Osgood and Alan Hudson had departed for Southampton and Stoke City respectively. 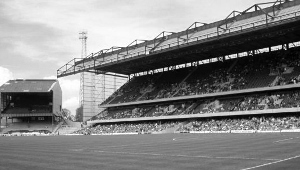 This yielded Chelsea more than half a million pounds, but the giant shadow hanging over the club were the mounting debts from the construction of a new, three-tier grandstand that was supposedly the most modern in football. In other words, very little of that cash was used to build a new Chelsea team. And what money was made available was ill-spent. In the summer of 1974, Dave Sexton bought David Hay, a full back from Celtic that had impressed in Scotland’s World Cup campaign. Hay was more than decent, but he was a full back and Chelsea were in dire need of charismatic players to fill the gap left by Osgood and Hudson. A cut-price signing in the form of John Sissons, the former West Ham winger, was also added to the squad. Chelsea struggled from the start of 1974-75 and there was a sense of inevitability that relegation would come at the end of the season. Players like Chris Garland, Bill Garner, Ian Hutchinson, Steve Kember, John Hollins, Ron Harris, Peter Houseman, Charlie Cooke and Peter Bonetti were reminders of the glory days, but without the icing on the cake, Chelsea looked second rate. Dave Sexton was sacked and the club looked to former winger Frank Blunstone to take over as manager. He was working at Manchester United with ex-Chelsea manager Tommy Docherty but declined the £15,000 a year job at Stamford Bridge. 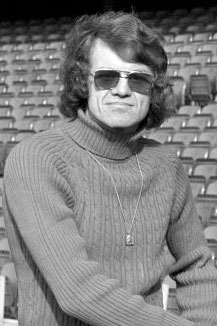 Chelsea clumsily managed the role in-house until the end of the season, with Ron Suart and then Eddie McCreadie taking over. When McCreadie was installed, the ship was almost sunk. There were three games remaining and Chelsea were one place above the drop zone. Their destiny could still be of their own making, given they had two of their three games at home, but morale was low and no amount of self-assured sound-bites – a great McCreadie trait – could save the club. The key game, arguably of the next decade, would be Chelsea’s visit to Tottenham on the penultimate Saturday of the season. 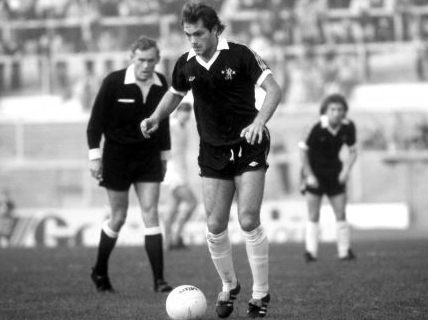 McCreadie had gambled in his first week in charge, installing 18 year-old Ray “Butch” Wilkins as captain. He also brought in a young, cocky forward named Teddy Maybank. Out went old McCreadie acolytes Hollins and Kember. It was bold and hinted that McCreadie was looking beyond the current season and perhaps a second division promotion bid. Dispensing with old heads like Hollins may also have been an indication that McCreadie didn’t want to be handling players he used to line up alongside. Chelsea lost 0-2 at Tottenham in the great relegation play-off. In fact, they failed to win the two homes games, drawing 1-1 with both Sheffield United and Everton. It was a depressing tube journey from Fulham Broadway back to central London, but McCreadie, appearing on TV on the following Monday, assured Chelsea fans that promotion would be “ no sweat”. In August 1975, Stamford Bridge was a tired place, despite its gleaming grandstand, which looked as though a set from a Gerry Anderson show like Thunderbirds or Stingray had been transposed into the middle of an olde worlde village. Nobody really knew what Chelsea’s team would look like in 1975-76, but one thing was clear – the balance of power in London football had shifted. As well as Chelsea’s decline, Tottenham and Arsenal were also going through some soul-searching. Spurs had just stayed up and Arsenal’s Bertie Mee was coming under extreme pressure at Highbury. Queens Park Rangers, now under Dave Sexton, were developing an exciting brand of football that the former Chelsea boss would have loved to have developed at the Bridge. And West Ham had won the FA Cup and were in Europe. The average age was under 25. Chelsea lost their opening game, but two wins at Stamford Bridge by 3-1, against Oxford United and Carlisle United were promising. But it was soon clear that Chelsea didn’t have the experience or the balance to mount a promotion campaign. While Ray Wilkins had the vision and, to quote that Italian footballing “rainmaker”, Gigi Peronace, “fantasy” in his play, you could see his occasional frustration as his team-mates failed to move in sync with him. Chelsea’s evaporating promotion hopes were reflected in the home form and the attendances that went with it. Chelsea won five of their 11 league fixtures at Stamford Bridge leading up the new year and the average gate was barely 20,000. If the alarm bells were not ringing on the terraces, they certainly were in the boardroom, because it was well known the club needed 30,000 to break even. Every week seemed to bring a new low, or at least confirmation of the club’s new surroundings. York, Nottingham Forest, Bristol City, Bolton, Plymouth and Charlton all came away from London SW6 with points, while on the road, Chelsea’s form was also in need of improvement. Oldham Athletic, Fulham, Luton and Southampton all inflicted defeat upon McCreadie’s side, and with each loss, cries of “Osgood, Osgood….” and even “Sexton, Sexton”, could be heard. McCreadie still had utmost belief in his “Kids” and claimed that when they returned to the first division, they would “terrorrise” football. But the only thing about Chelsea that was “terrorising” was the unsavoury element among the fans on some away trips. To some extent, it was the 1975-76 season that built a reputation. At one point, people did start to question whether the talk about Chelsea’s great youth policy and a generation of players that could dominate football was just that. McCreadie was certainly more Docherty than Sexton but the bookies clearly believed it too – Chelsea were 4-1 favourites from the start, although by December, it was becoming clear that it was not going to happen. Not many of the class of 1975 became top players and some had been kicking around the club for a few seasons. Sherwood was soon dropped to make way for Peter Bonetti, who returned from the US to help steady things. Graham Wilkins and John Sparrow were never more than average defenders, indeed the former suffered greatly from being “bro of Butch”. Ian Britton was a busy and loyal Chelsea man but disappeared from view when he left the club. Maybank was soon dispensed with, making way for another player who had been sitting in the shadows for a few years, Steve Finnieston. After an excellent season in 1976-77, Chelsea let “Super Jock” go in 1978 and his career went nowhere, largely due to injury. Gary Locke was another player like Britton who enjoyed a long Chelsea career. The real successes of the Chelsea side were Ray Wilkins, Kenny Swain and Steve Wicks, all of whom were sold to help bolster the bank account. Garry Stanley, who had to wait so long for recognition at the club, was also sold for a sizeable fee, but he had lost his way at Chelsea by that time. Chelsea finished a very tepid mid-table in the second division in 1975-76 but their form in the last few weeks suggested better times. In the summer of 1976, though, there was a huge bombshell as Brian Mears, the club’s increasingly forlorn-looking chairman, revealed the extent of the club’s financial position. Chelsea were almost finished – promotion would have to be won in 1976-77. McCreadie did get it right, but there was some recognition that the old hands like Ron Harris, Bonetti, Cooke and David Hay could play a part. It wasn’t quite “you win nowt with kids”, but the secret to success in football has always been that old cliché, “a blend of youth and experience”. 1977 was only temporary respite for Chelsea. McCreadie left after winning promotion in an argument over a contract and a car. Chelsea seemed to let him go without a fight. They went down again in 1979 and thus began an “era of nothing”. Between 1975 and 1984, Chelsea spent seven years in the old second division. Hard to believe today, isn’t it? 75-76 saw my first forays to Stamford Bridge but given all the recent success at Chelsea, my favourite season of watching will always be the 1976-77 campaign. Backs against the wall financially, but a wonderful home grown side who were a delight to watch. Agree with Paul above. For all the success in the last 20 years, the promotion campaign of 76-77 remains my favourite. The crowds came back, the atmosphere was electric and the football was captivating. The was a real sense of camaraderie between the players and the fans, felt as though we were all in it together. Maybe, just maybe if Eddie has stayed that team would have blossomed in the first division. Cash for Chelsea and that beach buggy that drove around the ground, Super Jock and Kenny Swain, 3-1 against the Saints…I could go on. I agree 100%, a memorable season. Some very poor player’s. ….Charlie just going through the motions, a woeful catty should rightly retired. Harris still excellent and the brilliant Wilkins. Overall a deeply depressing time. Bad teams, management and boardroom. Blanchflower a whimsical dreamer, Hurst a bad fit. Thank god for Ken Bates. Previous Entry Football Media Watch: Wilshere or won’t he?